We don’t have pasta super-often in comparison with near-daily rice, and so this dish ended up looking pretty fancy with all CSA basket veggies. First, Yusuke sautéed chopped beets and their greens in olive oil and fresh garlic. The beets were not the stereotypical red/purple that we would expect, but were rather more orange and especially crunchy. Next, he sliced gorgeous deep purple onions and soaked them in water to reduce bitterness. After draining the onions, he mixed them with the beets and fresh basil and added balsamic vinegar, soba sauce, and lime juice. It was all served over the room-temperature pasta, spaghettini to be precise. Most tasty for summer. Pasta just seems right for Sunday dinner (or so says Yusuke). We had acquired a giant monster savoy cabbage from the Atwater market that Yusuke decided to employ in this angel hair pasta dish. He started by chopping the cabbage into bite-sized pieces. He also halved cherry tomatoes and removed the seeds. Meanwhile, he boiled water for the pasta, adding powdered beef bouillon and black pepper. Next, he sautéed a healthy amount of garlic and olive oil in a frying pan until it became fragrant. At that point, he dumped in the cabbage. Once it started getting soft, he added the tomatoes and cooked them briefly. The pasta was not fully cooked in the boiling water—it was left a tiny bit harder than al dente. He added the pasta to the frying pan along with 1-2 ladles full of the broth from the pot. He mixed everything together and let the pasta cook a bit more. The original recipe called for anchovies, but lacking these, Yusuke used 1 tsp of Nam Pla (Thai fish sauce) instead. The mix of the cabbage and tomatoes was excellent, with the latter particularly super-sweet. We also had a simple egg-drop soup. The base was water with 1-2 tsp of dashi, 1/2 tsp salt, 1/3 tsp sugar, and 1 tsp each of soy sauce and sake. The veggies were green onions and white mushrooms, both fresh from the Atwater market. Yusuke and I shared a quiet New Year’s Eve at home, and he made us a lovely feast for the occasion. He said that the components of the menu didn’t really match, as it turned out to be a combination of stuff that we wanted to finish off from the fridge. Oh, well. The most important part was the soba—thin buckwheat noodles. Soba is traditionally eaten in Japan for New Year’s, with the noodles symbolizing good luck for long life. This batch was a gift from my mother-in-law. It can be eaten in many different ways, but in this case, Yusuke boiled the noodles without sauce and then arranged them on a plate. We each had a bowl of dipping sauce made from soy sauce, sugar, mirin, sake, dashi, and a tiny bit of salt. We mixed in fresh green onions and either wasabi or ginger. The eating procedure is to take a good amount of noodles from the plate, dip them into the bowl briefly (being sure to catch some green onions), and then slurp them into your mouth. I’m still working on my slurping technique. Note also the lovely small white dish and blue bowl: Christmas presents from my mom. Earlier in the day, Yusuke had said that pickled tako (octopus) was a typical food eaten at New Year’s. I saw some at the grocery store, so I bought it, sort of as a joke. But then we had to use it! Hmm. Yusuke made this beautiful salad, inspired by a recipe found online. First he chopped the tako, rubbed the surface with salt, and rinsed it. Then he boiled the pieces in water and a bit of ginger ale. The latter was in lieu of club soda, which he had read helps to tenderize the octopus. The cooked tako was mixed with chopped raw vegetables: white onions, celery, and cherry tomatoes. I believe that his recipe called for parsley instead of celery, but we wanted to use the monster stalk left over from our Christmas dinner. The salad dressing was 55 mL of rice wine vinegar, a bit of olive oil, and salt & pepper. The final dish for New Year’s Eve was very simple: boiled pieces of cabbage with some of the sauce used for the soba, garnished with bonito flakes. I had been craving cabbage and ate about 5 servings. On New Year’s Day, the special foods continued. The first dish was mashed sweet potatoes with sugar. Yusuke thinks he used about half a cup of superfine sugar. Unfortunately, this doesn’t quite match the sugar that would be used in Japan, which to all accounts gives a greater depth of flavour. This represented the New Year’s dish kurikinton, which should be made with either mashed chestnuts or a combination of sweet potatoes and chestnuts. The main attraction was ozōni (お雑煮), which is essential to Japanese New Year’s. The soup had spinach, daikon, carrots, shitake mushrooms, and chicken. The broth consisted of sake, soy sauce, salt, and dashi. It was so flavourful that it was hard to believe that it was that simple. The mochi was added last, wonderfully sticky and filling. We also had leftover tako for lunch, which was dipped in wasabi and soy sauce. Yum. All-in-all, these were meals to promote a healthy and lucky start to 2010. Yusuke also broke open his Christmas/birthday package of dorayaki on New Year’s Eve. So. Good. I’ve written about Yusuke’s Japanese-style pasta before, and it’s an apt example of the flexibility of Japanese cuisine. The pasta itself is just run-of-the mill spaghetti, boiled in water and olive oil with a little bonito powder (dashi) added. For the toppings, Yusuke sautéed pork and eggplant in a mixture of miso (paste mixed with water), mirin, sake, and sugar. Then he added the pasta to the frying pan with more miso and a splash of soy sauce. He served the pasta with freshly chopped green onions sprinkled on top. I’m tempted to use a clichéd simile to describe the complementary relationship between miso and eggplant…but to say that they go together like peanut butter and jelly just sounds gross. At any rate, they’re perfect foils for each other. The dish wasn’t salty, but it certainly had a distinctive miso flavour. To balance the rich taste, our soup was simply spinach and mushrooms in water, soy sauce, and dashi. In contrast with Yusuke’s Japanese-style pasta, this dish was distinctly Italian. 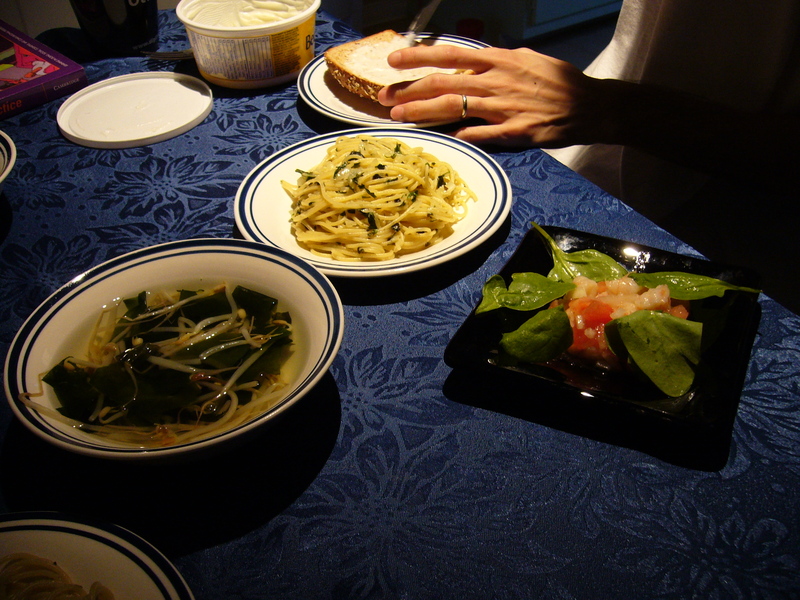 Not one of our lower calorie meals, Yusuke boiled the pasta in a mixture of olive oil and water (as usual). 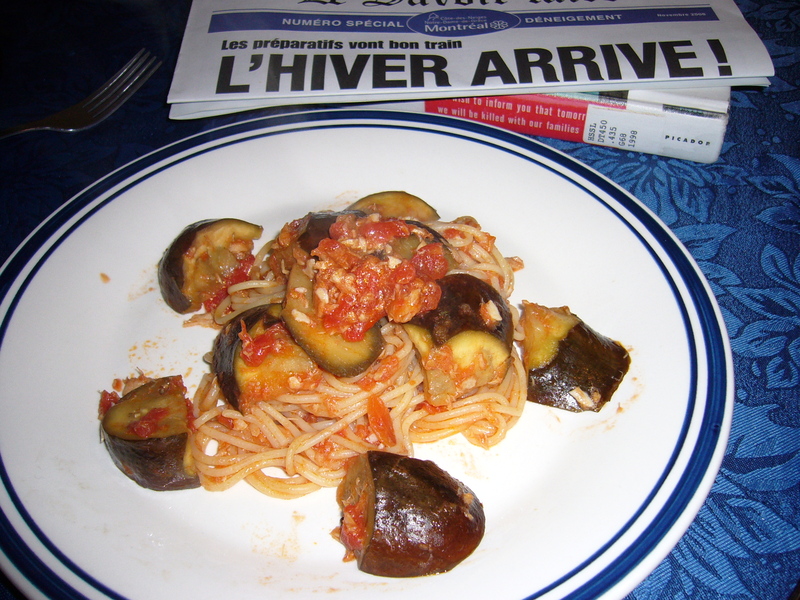 While the pasta was cooking, he prepared the sauce in a frying pan: succulent eggplant cubes, canned tomatoes, and lots of garlic. After the pasta was nicely al dente, he added it to the sauce in the pan and cooked it all for a bit longer. We had a light soup on the side: miso with seaweed and bean sprouts. On a related note, I’ve concluded that the best way to winterize one’s home is to move to Hawaii. Yup.